I don’t like that name It is a corruption of Judas’s Ear and comes from the idea that Judas hanged himself from an Elder tree. It is very unlikely that Judas did choose an Elder, they don’t grow very tall and they just don’t have the right growth habit for suicide. I don’t think that there is any mention of an Elder Tree in the New Testament (Scholars of the Bible feel free to correct me). The idea that an Elder was involved stems from fourteenth century English literature. A time when it was the practice to malign trees as well as people. It was the oppression of Paganism because Pagans worshipped trees. Now I am not Anti-Semitic and I quite like Pagans and their trees, so I have two reasons for not liking the name Jew’s Ear. 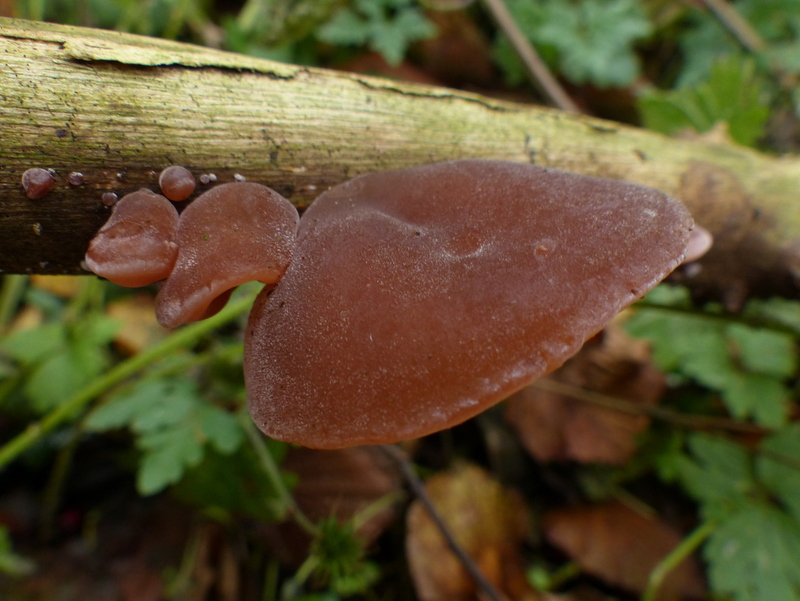 It is hard to escape though because the Latin name is Auricularia auricula-judae. From the Latin Auricula meaning “Ear,” It is an Ear Ear-Judas. That Latin is in itself wrong because the rules of taxonomy (Binomial nomenclature) say that a species name can comprise of only two words but they have got around that by adding a hyphen. 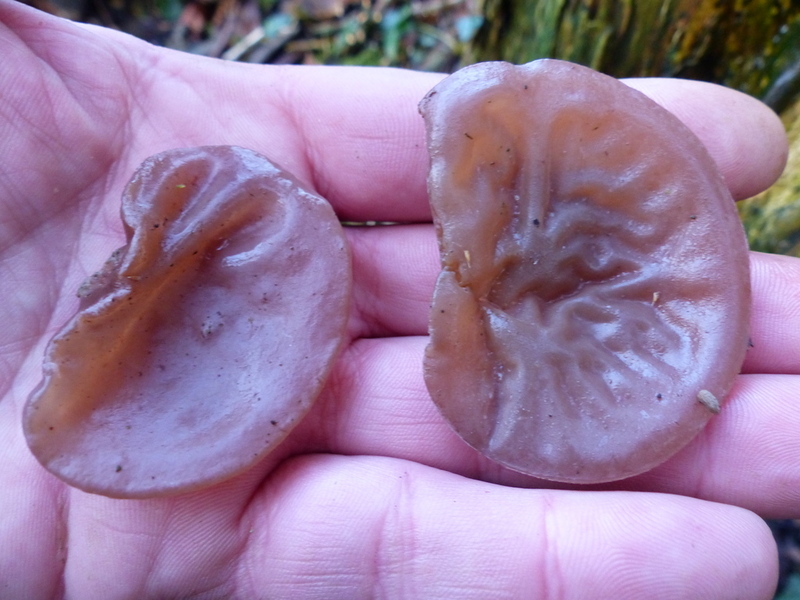 Some people still refer to this species as Auricularia auricula which is actually more correct and drops all of the oppressive connotations. Well it does look a bit like an ear. 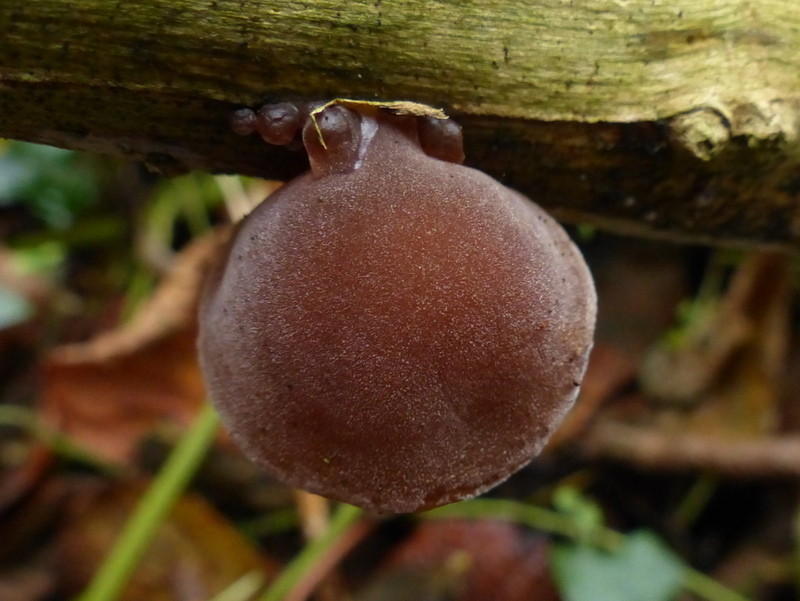 Other common names for this fungus are Jelly Ear and Wood Ear. 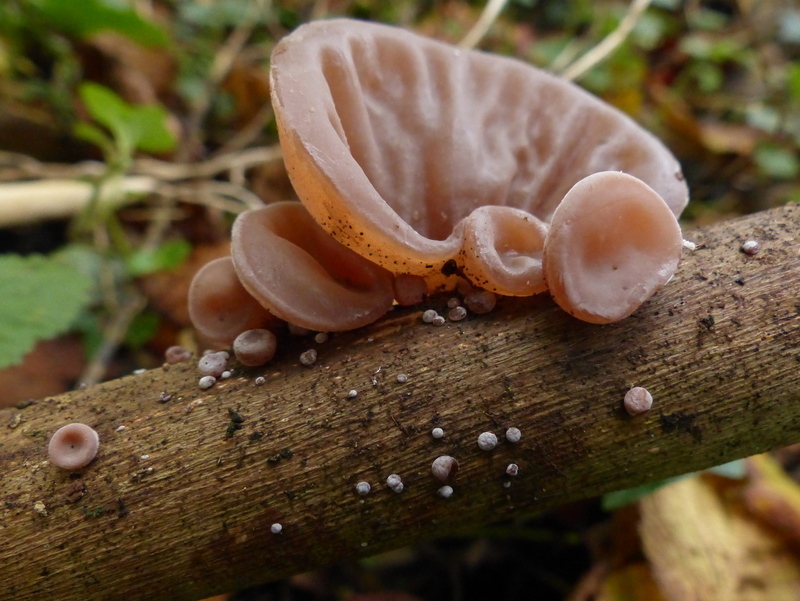 It is a Jelly Fungus and it does grow on wood, so they are both good names. ….and brains, at the same time. So where does the Elder Tree come into this? Well you will almost always find it growing on Elder. 90% of the time, it does grow on other wood like Sycamore, Beech and Spindle but nearly always you will find it on Elder. 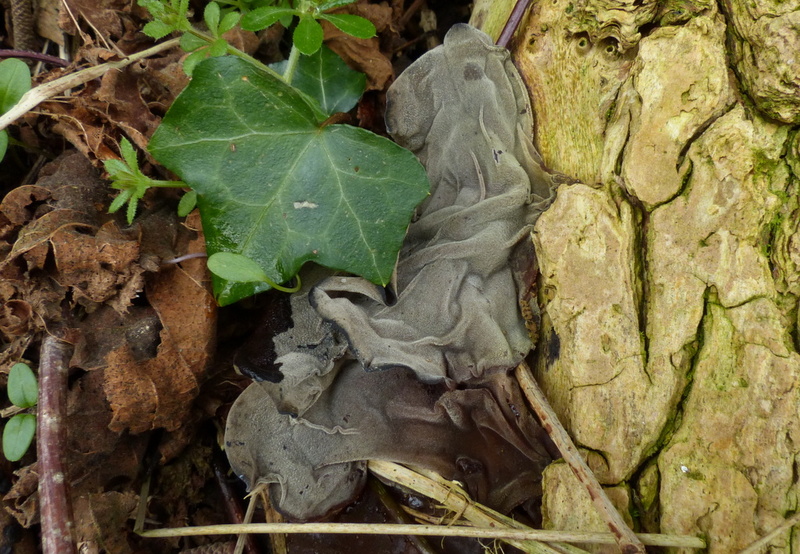 It is saprobic, it mostly feeds on dead wood but occasionally parasitic too. Technically it is edible but nobody eats it in the West. (it is a “wont’t kill you but is horrible” type). It has a history of use in Herbal Medicine where it has long been used specifically to cure sore throats (Boil in milk and gargle with it). I think that this is probably nonsense based on the idea that Judas would have had a sore throat when he hanged himself. It is widely eaten in the East. There is a Chinese culture of serving medicines in food and a medicinal soup is made from this fungi to cure colds and fevers. When the fruit dies it looks like this. 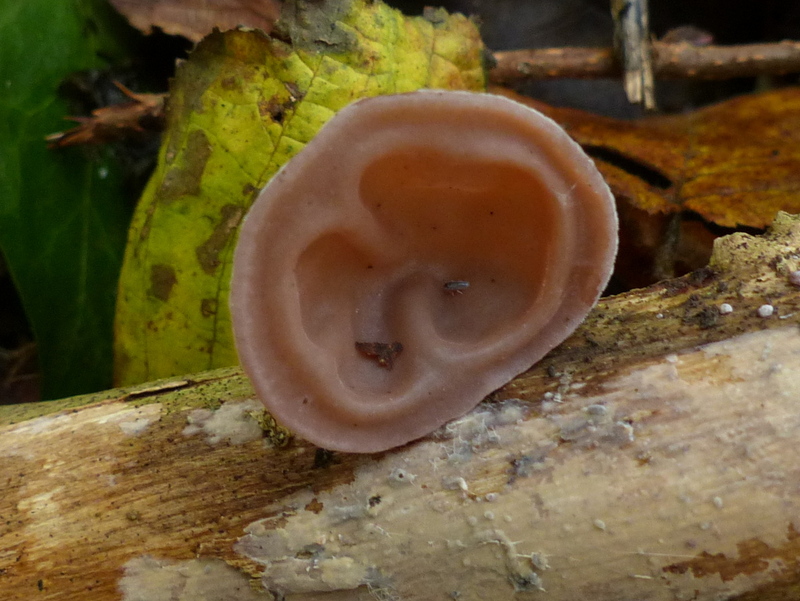 That is my little Wood Ear. Now a Pixie must be looking for these.. Thanks Pamela 🙂 I do agree. My (Chinese) wife has 2 cousins who are both TCM doctors and they would definitely use this jelly fungus. I will try to find out what it is prescribed for. 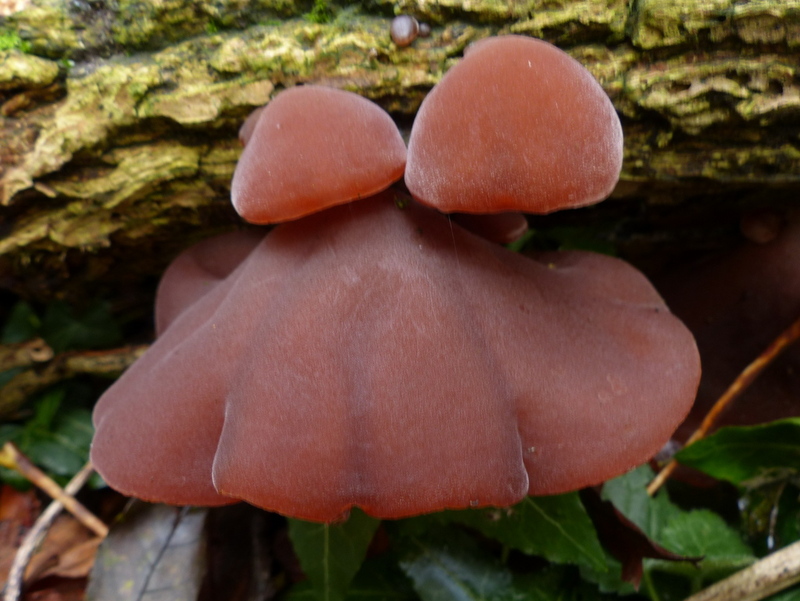 Thank you Andrew 🙂 I agree that your picture looks like Auricularia polytricha or Cloud Ear Fungus. 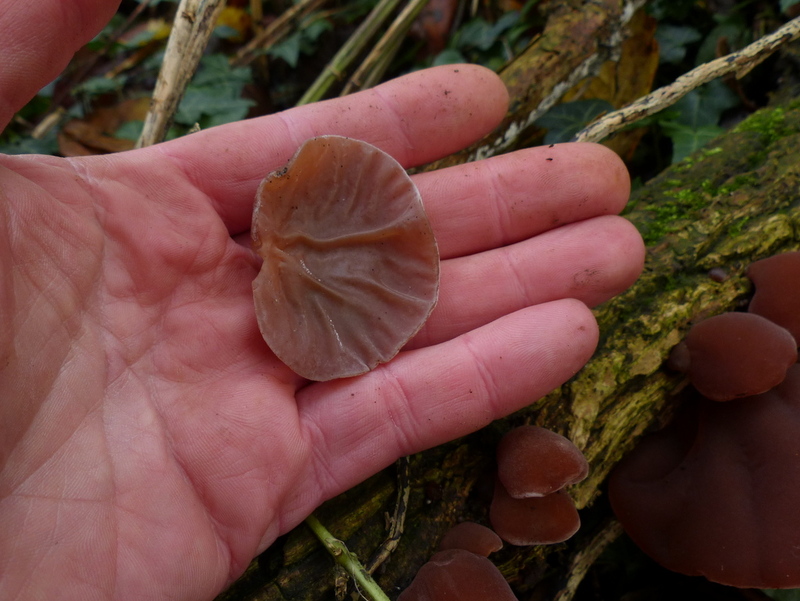 The Chinese call it Hairy Wood Ear. 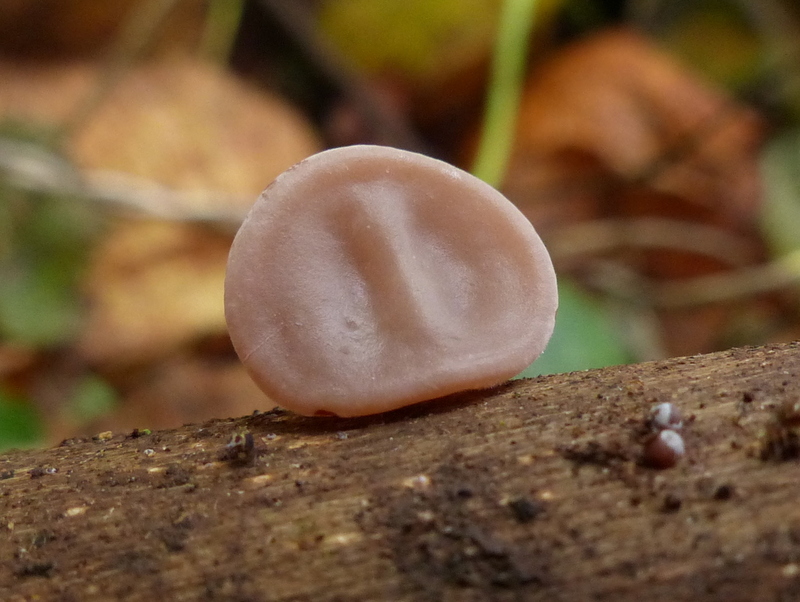 I think that the two species are used in the same way and more or less interchangeable but that Auricularia polytricha is more suited to the climate over there and is more widely cultivated. I get dried wood ears (called black fungus on the package) from an Oriental store near here, and they have little taste of their own but do add a crunchy, interesting aspect to Chinese soups. This is such an informative post! Thanks Sarasin 🙂 Are your ears hairy? 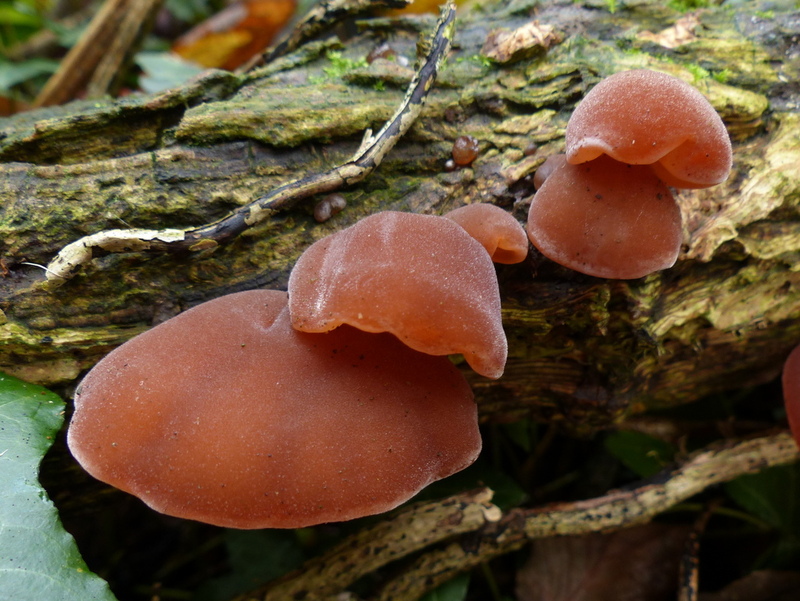 🙂 I think they might be Auricularia polytricha also widely used in Chinese cooking and usually sold dried but the two species are very similar. See Andrew’s comment above for a picture. I only see them in strips, already dried and packaged, so I never see any hairs, no. 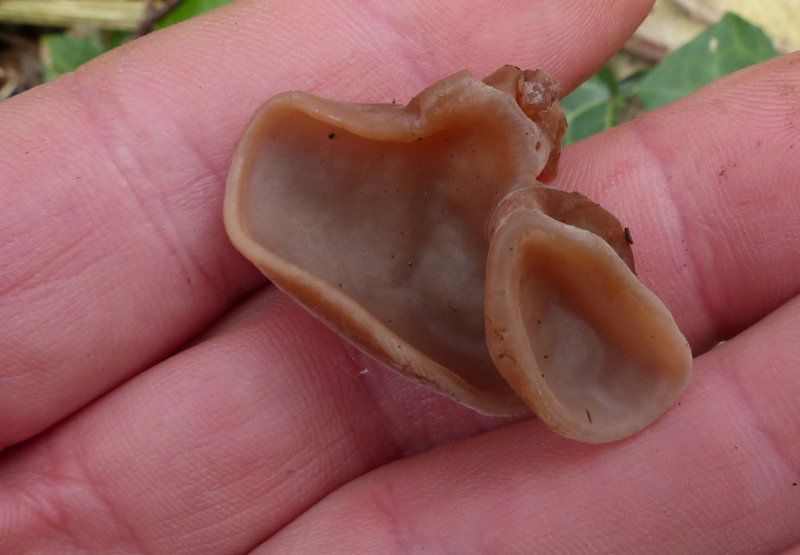 They’re called wood ears and black fungus, depending on which package I buy. Maybe two separate but similar things then. Found this link when investigating the Elder tree: http://www.dalswildlifesite.com/theeldertree.htm I at first thought this might be a ‘Box Elder’ tree, but discovered otherwise. 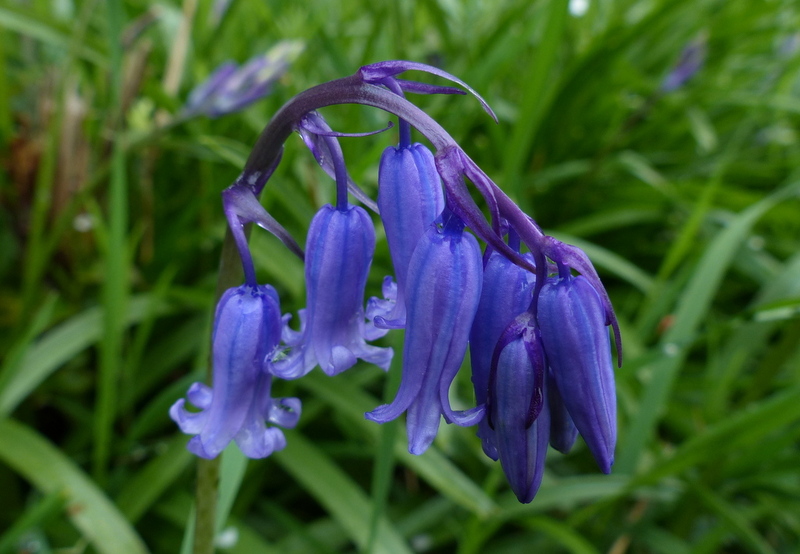 The link tells of all sorts of interesting uses for the leaves, flowers, and berries. Also mentions your fungi. As a child, the Elder plant grew in my yard, I would crush the berries and make ‘ink’, but mostly I just stained my hands and made a mess. It looks to be a beautiful tree. Thank you for the link Joy 🙂 I got myself lost on Dal’s site for a little bit, must bookmark it for later. I agree the Elder is a beautiful tree, it gives so much to the hedgerow. I’ve got plans for these ears in my digital designs. I’m getting bored with “normal stuff.” I see some really cute critters in the makings. Thanks! Thank you Sandi 🙂 That sounds like fun and something to look forward to. I like the idea of including medicinals in our regular meals. It brings to mind how my family is trying to eat healthy, which has a similar underlying idea. Better than eating foods that were slowly killing us! Those ‘ears’ look like they came off a teeny tiny elephant. You might have sad, tiny elephants in your woods. I would leave out peanuts to comfort them. We in the West are becoming more of a culture of eating medicines as food too. Thank you Don 🙂 I know. Fortunately I have not had to resort to swallowing pills yet but I get older everyday. Fun and informative, Colin. Some of them really do look like ears! Fascinating. I, of course, loved the picture of the dead shroom…either way it’s cool to look at. 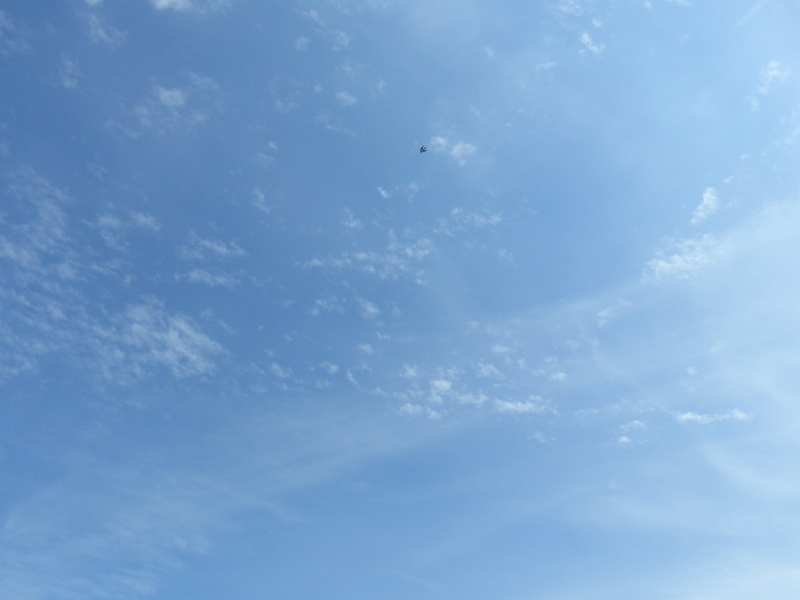 What does it feel like? I think it must be soft on one side and sort of gelatinous feeling on the other. My great aunts in Ballarat would only go to local Chinese Doctors. During the Gold Rush they were the only medical people around and were quite popular. Thank you John 🙂 I am really enjoying your Monuments blog and the history.I wouldn’t have known that you even had a Gold Rush if I hadn’t read your posts. Keep them coming. What a fabulous find. I have been looking out for these locally but haven’t seen any so far. Thanks Clare 🙂 Keep looking there is a lot of it about. 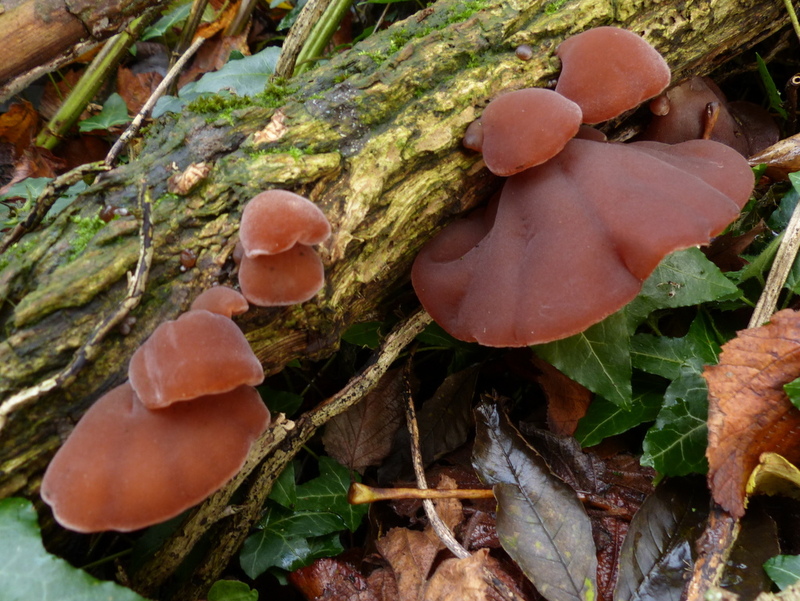 Jelly Ear and King Alfred’s Cakes too. 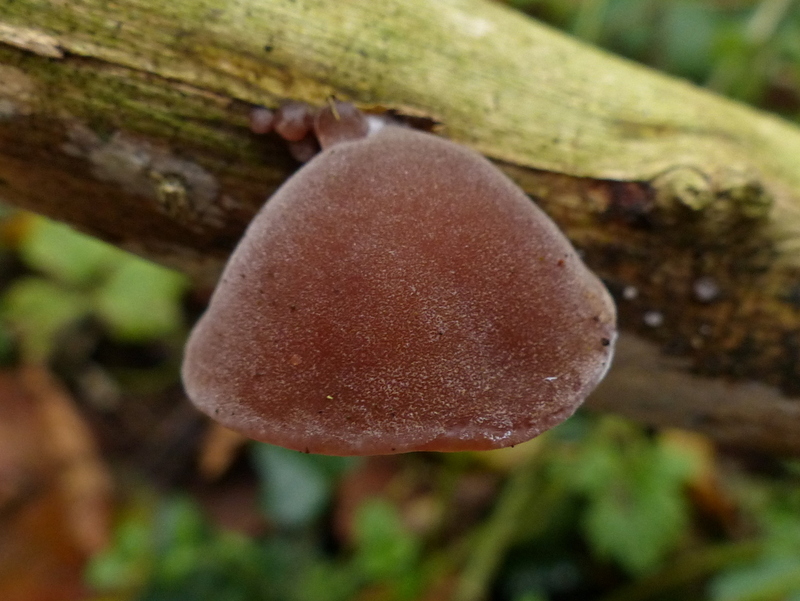 I mostly find the Jelly Ear on dead wood on the floor, at the base of the hedgerow. So in the tangle of branches I am looking for the light coloured ones that might be Elder. I found two new patches today although one was several feet up on an apparently healthy tree. I will continue my search! Thank-you Colin. Interesting how views and values change re offensive names. We have wandering jew (Tradescantia fluminensis) as a weed in Oz. 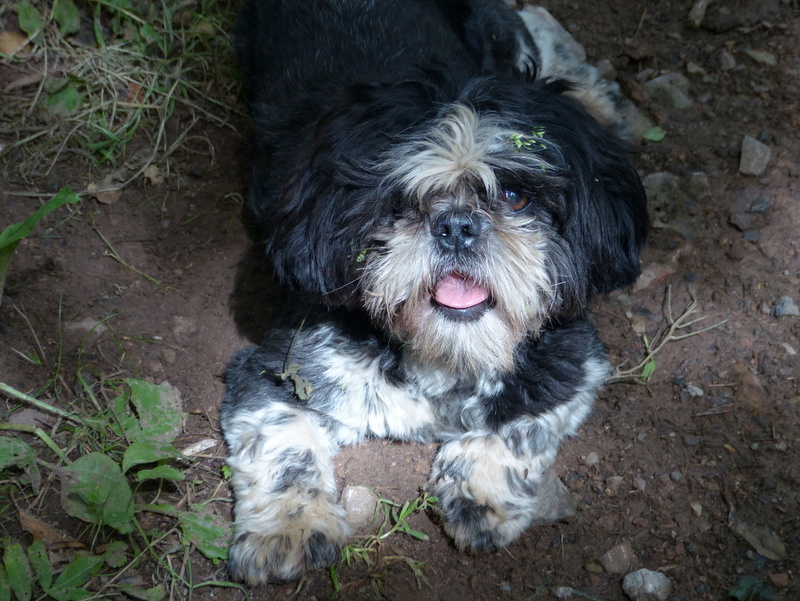 When I did a bush regeneration course, the lecturer called it ‘trad’ rather than use the offensive or old-fashioned name. We also have grass trees (Xanthorrhoea, 28 species), which used to be called ‘black boys’, name changed for the same reason. Had never heard of this before. Thanks. Thank you Emilio 🙂 There is apparently endless diversity in the world of fungi. Wow. 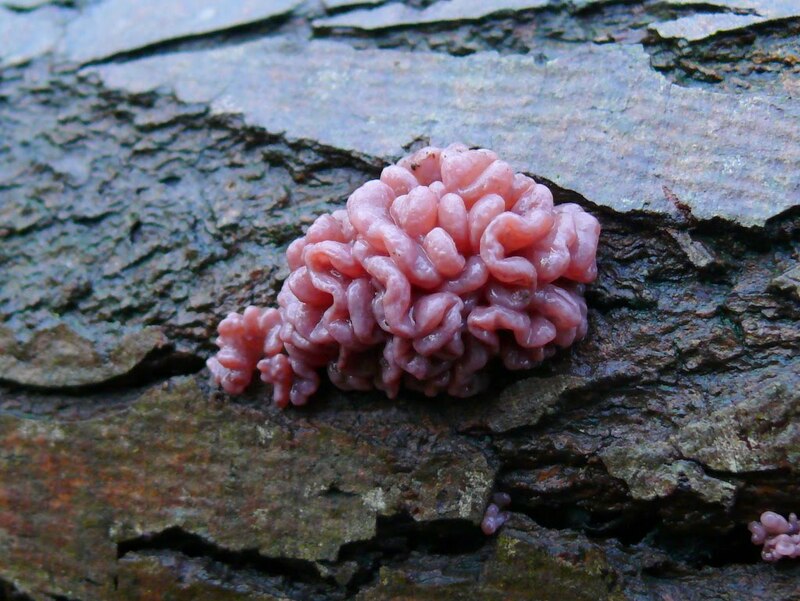 Just as I was thinking slime mold was as interesting as things could get.